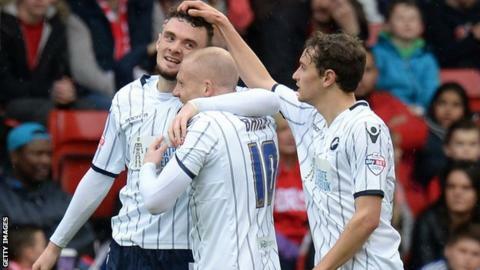 Nottingham Forest's play-off hopes suffered a setback with defeat by a Millwall side whose victory helped their battle against relegation. Scott Malone put Millwall in front with a shot from the edge of the area which seemed to take a slight deflection. Lee Martin cut in from the left and scored with a low curling shot to extend the visiting side's lead. Jamie Paterson flicked in a header to pull one back for the home side but the Lions held on. Victory was their first in six Championship games, but was not enough to move them out of the bottom three. Millwall, in 23rd, are still two points adrift of Charlton, who hold the first position of safety and have two games in hand on Ian Holloway's men. Forest, being managed by Gary Brazil until Stuart Pearce takes over on 1 July, are five points adrift of the play-offs after a 10th successive league game without a win. Millwall's game plan was to stifle Forest and hit them on the break, and it was an approach that worked perfectly during a one-sided first half. The visitors took the lead when striker Stefan Maierhofer fed Malone, whose low shot beat keeper Karl Darlow at his near post, seemingly with the aid of a slight deflection. Millwall struck again six minutes before the break as Martin punished a Forest side who were yet to mount a threat. The home side did pull a goal back when Dan Harding crossed for Paterson to head in, but they could not find an equaliser. "I did not see that first-half performance coming. The players have been in a positive frame of mind, following the display at Ipswich. But after 20 minutes today you could see we looked nothing like that. "We did not want to earn the right to play. We did not want to do the scruffy side of the game. We didn't win headers, we didn't win tackles, we did not stop them from playing the way they wanted to." "It was a vital win, we just need more of the same in the remaining games now. "I picked a different team this week but that team got beaten in training by the ones I didn't pick. I wasn't very happy, so I made five or six changes to that team, to include some players who had confidence. "The crowd got behind them in the second half and we hardly got a decision out of the referee. But we got the win." Match ends, Nottingham Forest 1, Millwall 2. Second Half ends, Nottingham Forest 1, Millwall 2. Lee Peltier (Nottingham Forest) is shown the yellow card for a bad foul. Edward Upson (Millwall) wins a free kick in the attacking half. Hand ball by Scott McDonald (Millwall). Scott McDonald (Millwall) wins a free kick in the attacking half. Attempt missed. Henri Lansbury (Nottingham Forest) right footed shot from a difficult angle and long range on the left misses to the left. Assisted by Ben Osborn following a set piece situation. Henri Lansbury (Nottingham Forest) wins a free kick in the attacking half. Foul by Owen Garvan (Millwall). Dangerous play by Mark Beevers (Millwall). Attempt missed. Darius Henderson (Nottingham Forest) header from the centre of the box misses to the left. Assisted by Gonzalo Jara with a cross. Substitution, Millwall. Paul Robinson replaces Carlos Edwards. Henri Lansbury (Nottingham Forest) is shown the yellow card for a bad foul. Martyn Woolford (Millwall) wins a free kick on the right wing. Attempt missed. Edward Upson (Millwall) right footed shot from more than 35 yards misses to the left. Kelvin Wilson (Nottingham Forest) wins a free kick in the defensive half. Hand ball by Carlos Edwards (Millwall). Substitution, Millwall. Scott McDonald replaces Nicky Bailey. Steve Morison (Millwall) is shown the yellow card for a bad foul. Attempt missed. Henri Lansbury (Nottingham Forest) right footed shot from outside the box is close, but misses the top right corner from a direct free kick. Substitution, Nottingham Forest. Darius Henderson replaces Jonathan Greening. Corner, Millwall. Conceded by Karl Darlow.